I took some pics of the ad boards from commercial property agents. Lots of upstairs offices. One or two boarded up or broken down café type spaces including one with a To Let sign in the window. Left me wondering whether LSMC could operate in what is existing office space. Obviously you’d lose the passing trade, non-social-media traffic but still not sure how much that would be anyway. Also, don’t know if that sort of thing means a change of use and therefore requires some government interference, or looking at it in a more practical way, what you can get away with without upsetting Westminster CC. 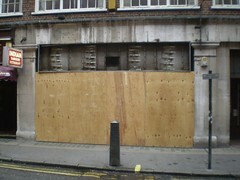 Bonus pic: Before I got that far, I went and snapped the New Piccadilly which is now closed and boarded up. Anyone (Russell? )have any pointers to stories or info on whether the signage or any innards have been preserved? 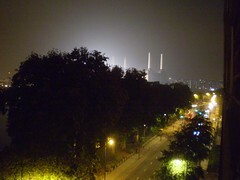 Battersea Power Station was all lit up last night, apparently for some night shooting on “Rory’s First Kiss” which turns out to be a fake title for the new Batman movie rather than Snogging in South London. No bangs, flashes or maniacal laughter was audible from this side of the river, but apparently the crew will be around for another week so maybe there’ll be more.